Advance directives are orders or commands given to a particular person or a group of individuals addressed or named in the form. Such forms direct the addressed to take the following steps on the person’s behalf in case of their incapacity or inability as directed by law. Such forms direct the addressed to take actions which are likely to have an effect on the person issuing directives, with their consent. Here’s a list of Sample Forms. 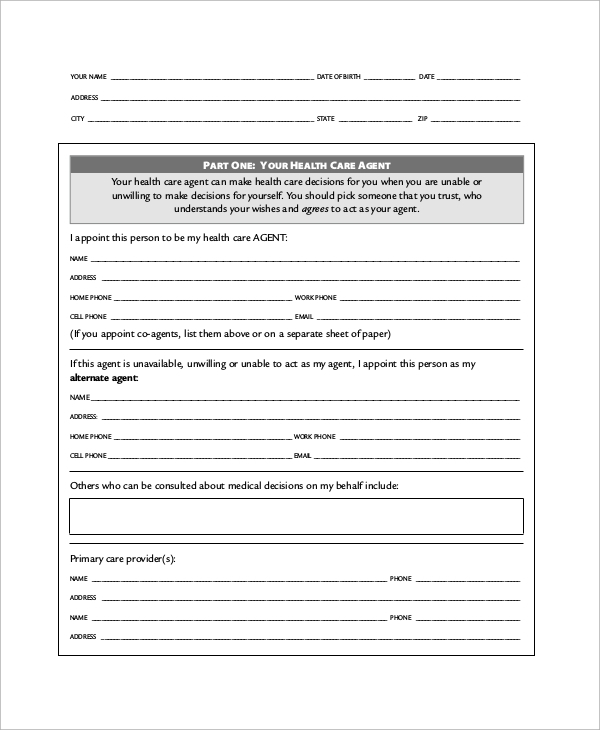 This kind of form allows the person filling in the form to give power of attorney to a person so that they may take all healthcare decisions on their behalf. An advanced directive combined form is a document which directs the individual addressed to perform listed duties in the event of the person’s incapacity or inability to direct their representatives. 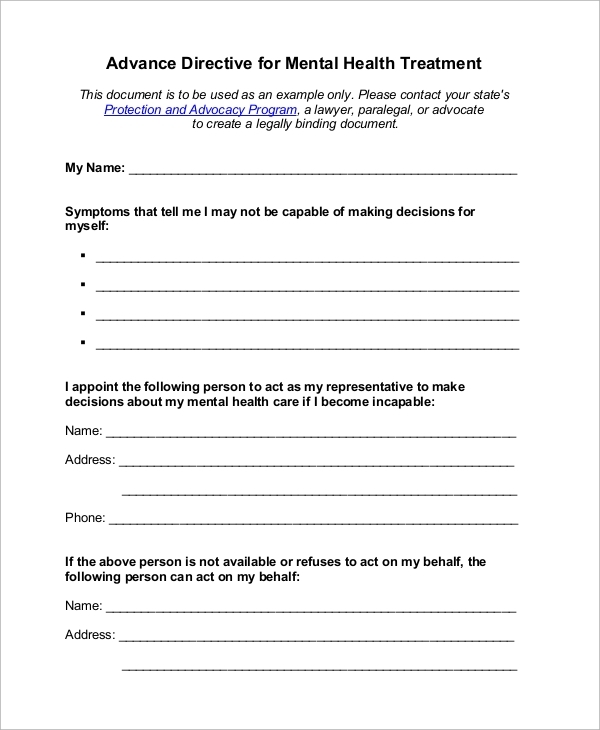 When a person is unable to take his/her decisions due to their aggravated psychiatric condition, this form is filled into direct people addressed to take their decisions for them. You can also see the Will Forms. 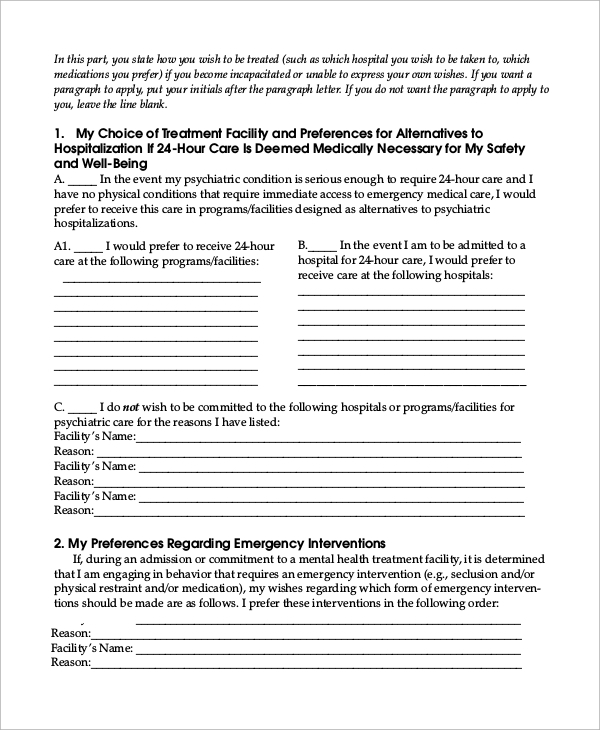 Advanced Directive Form Samples are useful when a person, aware of the consequences of the choices they make with regards to their physical and mental well-being. 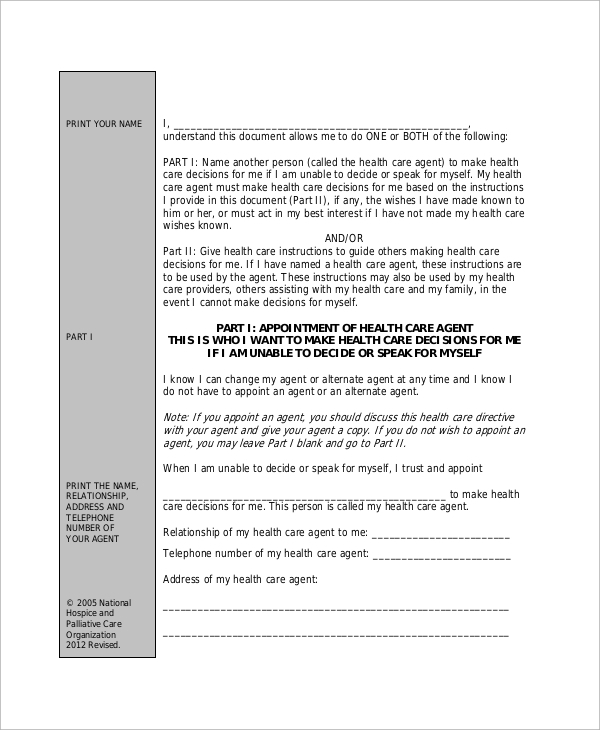 They delegate a power of attorney to a person designated as a health care representative who would take accurate decisions regarding the individual’s treatment. Any other related issue that would stem from the individual’s longevity when they would be suffering from a terminal illness or when they would have gone into an irreversible unconscious state. It will enable them to make decisions for them and thus allow their health care representatives to take decisions on their personal behalf. 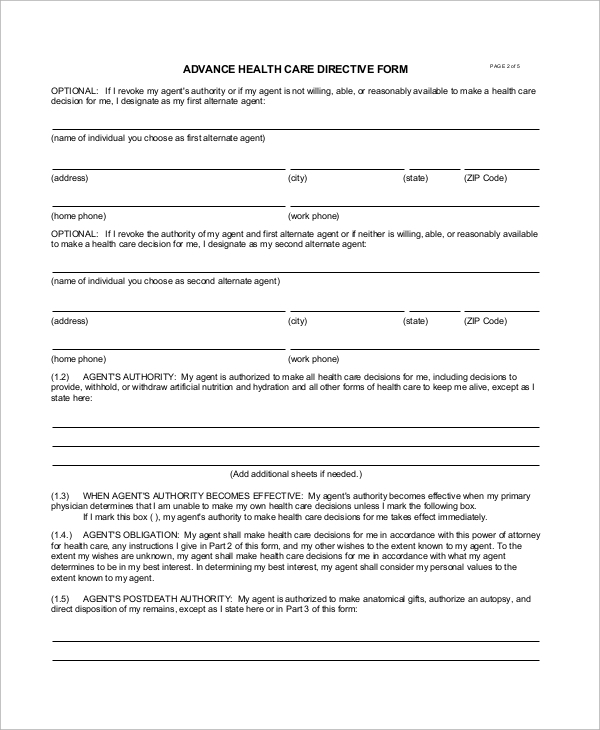 A medical form containing advance directives state the person’s wishes regarding medical treatment in the event of their inability to do so due to any irrevocable physical or mental condition. 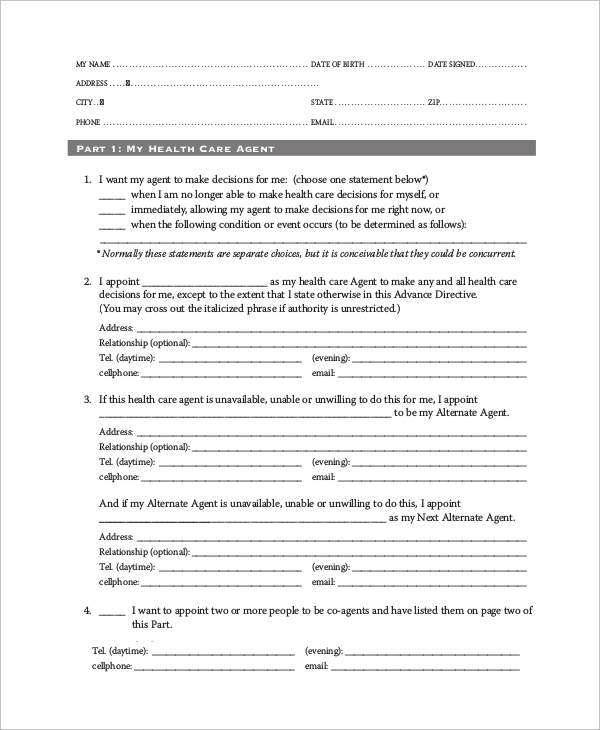 This type of advance directive form contains a long set of options for the person filling in the form, describing in specific details what needs to be decided when they are incapacitated. 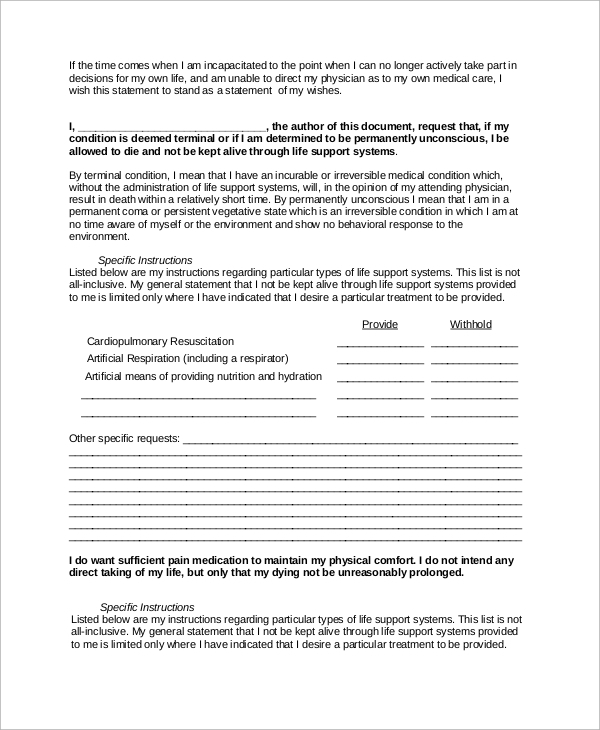 These Sample Advance Directive Forms are targeted towards individuals who wish to have their personal wishes and decisions secure in the case of an eventuality when they are unable to take decisions for themselves due to a terminal condition or a permanent vegetative state. Thus, it is necessary to know the legal provisions and statutes which govern the formation and approval of such forms, and it is important to realize how to wrap around the contents of the form along with legal formalities and procedures. A knowledge of these two things would be ideal for choosing or making the right kind of form. 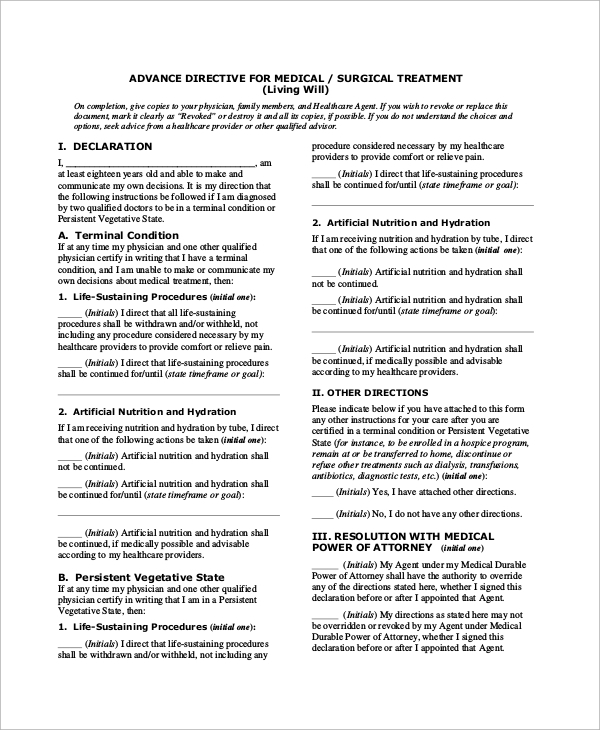 We have a large number of Sample Medical Advanced Directive Forms which are completely editable. Choose the template that suits your needs and edit in the relevant information in the form. Or, if you are a fan of originality, you may use the templates as a guide to make your form.